HTC is planning to launch HTC Wildfire Android phone in India. The HTC Wildfire is a minimal version of HTC Desire, which also has design elements from the Nexus One from Google. Similar to HTC HD mini Windows mobile handset, the Wildfire is a low cost alternative for the original handset. 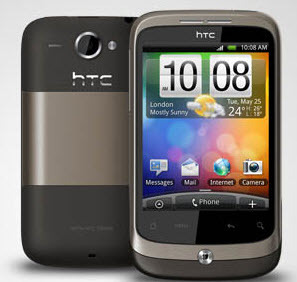 Already available in UK and European countries, the HTC Wildfire is an HTC sense enabled Android phone with social media connectivity. The device is best suited for people in India looking for a mini version of Nexus One or Desire. HTC Wildfire comes with a 3.2 inch capacitive touch screen that has QVGA resolution (240 x 320). The HTC Sense UI used above Android 2.1, makes it easy to carry out tasks, get weather information, access multimedia options, all from its home screen. Wildfire includes inbuilt applications like HTC PEEP, HTC Friend stream that let users to stay updated with their social life. It includes photo and video sharing tools designed to work with Facebook, Flickr and YouTube. Apart from the display, the major hardware differences in Wildfire, that separate it from HTC Desire are in its processor (528 MHz), RAM (384 MB ) and battery size (1300 mAh) selection. Both Desire and Wildfire have a 5MP camera with flash. HTC wildfire supports 3G and GSM networks in Europe and Asian countries. Other features of HTC Wildfire include 3. 5mm headphone jack, Micro USB port, Bluetooth with A2DP, WLAN, A-GPS, up-to 32GB support via card slot, multi-touch enabled web-photo browser, music player, FM radio, etc. The HTC Wildfire will soon hit the India market for a price around 15999 INR. dude, android phones come with inbuilt office applications, so u wont face any problems as such! windows apps are of .cab format which is not supported by android although u will find .apk version of most apps. Android is anyday far better then windows! I m waiting for it to be available in India, will buy it as soon as it hits the shelves! Hey Apoorv, thanks for your comment. HTC Wildfire is already available in India. Costs 15000 INR including taxes. can i have a dual boot with windows and android in the HTC Wildfire ??? and heard that some applets arent supported due to less resolution of the screen… is that true ?? is that a major setback as far as Android market is concerned ??? and anyone tried FROYO on wildfire ??? HTC Wildfire supports Google maps? do we have multi touch options while transverse the map as like in iPod Touch? Gaurav ur a a**h** not wildfire f*** u dont talk about the phone.